Maver North West man, Chris Weeder (jnr), is the second man through to this year’s big money Maver Mega Match This Grand Final at Maver Hayfield in September after topping a sell out qualifier event at Partridge Lakes. After a night of cold heavy rain showers, the sell out field were greeted with yet more cold rain coupled with flat calm conditions for this the second Mega Match This qualifier of 2018. Despite the conditions, spirits were high with weights expected to be reasonable. Chris drew peg 149 on Covey 6 and opted to fish 4mm pellet at 2.5ft and 3ft deep whilst feeding micros over the top for the duration of the match searching his swim for wandering fish. Chris found F1’s and carp up to 5lbs to end the match with 105-11-00 to finish just ahead of next best man on the day, Stephen Openshaw. Chris will now fish his second major final in as many year’s having qualified for Fish O Mania last year and now the 2018 Mega Match This final. Chris also books his place in this year’s British Pole Championship final on 19th August to boot! Chris Weeder (jnr) with part of his match-winning catch which sees him qualify for his first Match This final. “I’ve spent a lot of time at Partridge in preparation for this match. I was happy when I drew 149 with it providing a natural hideaway for the fish and, with the lake being pressured given the number of anglers in attendance, I hoped the fish would push into the space“. “I started across in 2.5′ of water with Spotted Fin 4.5mm expanders and micro’s and was into fish straight away. Although the stamp wasn’t great, I’ve caught steady for the first ninety (90) minutes. I knew I had a chance and was concentrating hard regards getting the feeding right. Halfway through the match I felt I needed to change something even though I had fish in the net”. “Just after mid way through match I had a nightmare losing a couple decent carp. I decided that the fish weren’t settled at the depth I was fishing at, so went deeper with a heavier rig and had a really good finish to the match catching really well in spells”. “I’d finally found the small carp that make the weight on this peg and ended the match still putting fish in net with my last fish of the day being the biggest fish of the day – a carp around 5lbs. I’ve ended up with seventy (70) fish for over 105lbs, which was just been enough to win the match and qualify for the final at Hayfield”. “I feel for Steve Openshaw! No words could ever help how he must feeling having come so close, but no doubt he will get another chance as he’s a class act. I can’t thank everyone enough for all the messages that I’ve received – I really appreciate it. I’m buzzing to be back in a big money final”. Lingmere Fishery owner, Steve Openshaw, fished a superb match to push Dave all the way to the wire ending proceedings with 104-06-00 from peg 2 on Spey lake. Opting to fish caster shallow over to the far bank, Steve enjoyed a frantic day’s fishing taking small carp in numbers up to 2lbs. Despite narrowly missing out on this year’s final on this occasion, Steve still qualifies for the Maver British Pole Championship final in August. Third place on the day went to MAP’s Jamie Hughes. 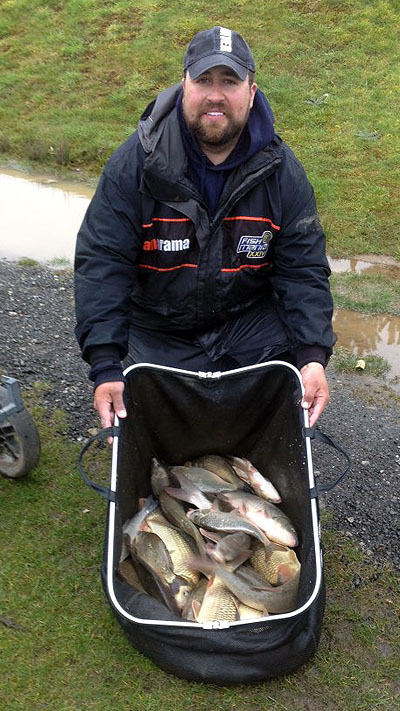 Jamie drew peg 9 on Marsh lake and offered 96-02-00 to the scales at the end of the five hours. Jamie caught on pole and pellet to take an all-F1 catch with fish up to 3lbs to take the last of the automatic British Pole Championship qualification places.